Small business operators often make this mistake as they grow. In this episode, learn how to scale up your business while protecting yourself. 02:27 – What are the risks? Is your business at risk? [Click To Tweet]. The metric that keeps your business under control. [Click To Tweet]. So next step is Business Services. And in Business Services section, I’m going to talk about a very, very important thing that comes up quite a lot in our weekly mastermind calls where I’m helping two types of business owners in SilverCircle more than any. One is the membership subscription community type business owner, who wants a recurring income that grows over time and gives them a lifestyle back, which is a very, very cool business model, and it’s the one that I’m super passionate about. And the other one that I find myself helping people with is the services business. As you are aware, I have a team of 50 people, got hundreds of customers buying recurring subscriptions for SEO, a lot of web development work in the industry. And this one is a strategic era that happens quite a lot for up and coming service businesses. This one’s called the big fish. And if you’re a small operator, imagine you’re like this small fisherman with a small boat out there, catching fish for a living. That’s exactly what a service business owner’s like. Literally, they’re out there, catching new customers, landing them, taking them back to shore. 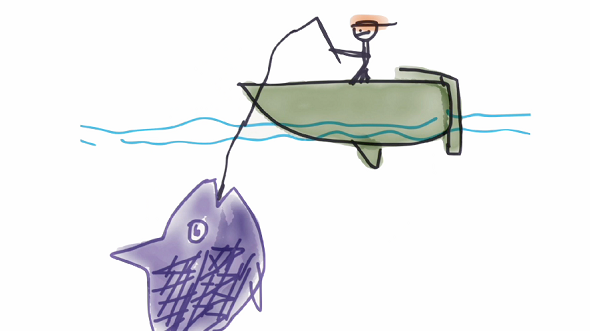 Now, if you hook too big a fish, it’s going to tip your boat over. And it sounds amazingly tempting to have a huge fish. Why, if you could just have one big fish, then you wouldn’t need to catch a hundred small fish, it would be just so much easier to get one big fish. But it’s not, actually. Have you caught a big fish? It’s going to break your rod, snap your string, it’s going to break your boat, sink you. And it’s going to use a lot of resource just to manage it. Even if you could get it back to shore, I mean the energy into cutting it up and transporting it and everything, you don’t have the capacity for it when you’re a small timer. So you have to grow your business around being able to deal for big fish. I mean if you go in the fishing scenario, you’re going to have a big tuna hauler, or a whaling boat, they’re going to be pulling in massive nets full of big fish. So the strategy is simply make sure that any big fish customer is not more than a certain percentage of your overall portfolio. I’d like to keep that percentage at a number like 20% or 30%. Make sure that at any one time, you don’t have more than 20% or 30% of your time, or attention, or resource devoted to one customer, because here’s the other big risk. The big risk is that your big fish goes away. And this exactly happened to several members over time where they’ve become heavily reliant on just one customer. And then that one customer has a change in business strategy overnight. Like literally, just sends an email, “I’m no longer needing this service. Thank you.” That’s it. Now, if that’s all your business, that means your business just took a nosedive. And it’s really like, basically, you put all this time and energy into chasing this big fish, and then you lose it. The line breaks. It’s gone, and you’ve got nothing. So make sure that at all times, you’d never let anyone get too big in terms of your overall portfolio and then you’re protected against losing a big fish. It also means you don’t have to do everything the big fish wants you to do. If the big fish takes all of your business, they’re going to be demanding, they’re going to treat you exactly like an employer, they’re going to tell you how it’s going to work, they’re going to tell you how they’re going to pay, they’re going to tell you what you need to provide them, because if you don’t, they’ll go. And if they go, then you’re stuffed. And that’s why you need to remove that compromise by making sure that you can, at all times, say, “Hey, you know what, if you don’t like it the way we do it, that’s fine. We don’t really need you anyway. See you later. It was so much fun. Have a good life.” And you can let the big fish swim away because it’s not going to destroy your business. So hopefully this is a lesson that will save you from making a very common error as you go from a small service business to a large service business. Never let a customer take more than 20% or 30% of your overall business, or supply 20% or 30% of your overall profit. Now that could be in terms of profit, or sales, or resource, or support; just keep an eye on your percentage. Whatever metric you want to take, you’ll know it if you have a big fish. If you have a big fish right now, and you just learned this, and you weren’t thinking about it before, then the action step is to go and get some more customers. Scale up, protect yourself.